You can use Google Calendar Sync to sync your Google calendar with your Outlook. I use it and it’s great. That sounds good. I have to use Outlook for my school email and personally cannot stand it. But yeah, if you depend on Outlook for email for work and whatnot, that’d be veyr helpful. i noticed to the left of some of your appointments you had a small square that looked like you could be a check mark in it. How do you get those next to your tasks? Gcal counts two different items: events and tasks. You can specify which category when you create an item. Events have a date, time and location, but no checkbox. Tasks have a checkbox and you can only assign them to certain days. And yes, you can check them off and they get struck through. I’m using Fantastical and I love it. 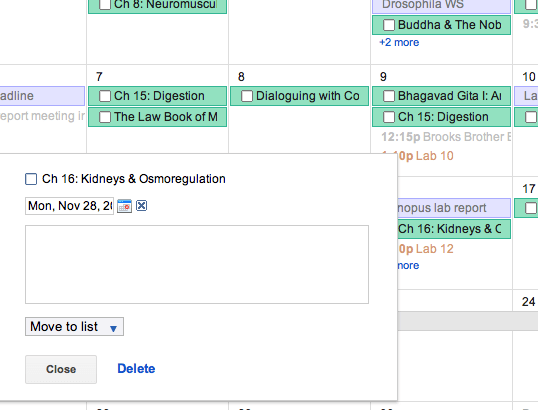 Sync with iCal and Google. I believe that there are advantages and disadvantages of both tools. Which do you highly recommend in terms of efficiency for school work? Thanks for showing your personal accounts with these tools! Like I said, when it comes to school, GCal is a winner, hands down. 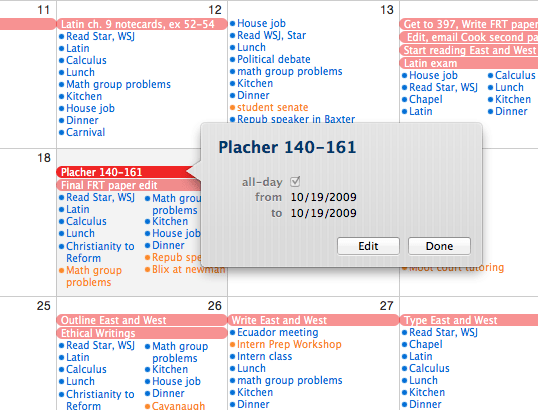 Years ago Excite lost all of my calendar entries. (Yeah, obviously a very long time ago). Couple of thoughts:both have their advantages and disadvantages, but….I admit I looked twice to see what year this was written. 1) Did you know that there is a “notes” field in iCal, where you can type/copy/paste longer lines? Granted, you have to look at the notes field by clicking on the events. I used it to hold details for reading assignments of the “read pp 350-359, 400-430” etc. type (I recently finished a professional degree). 2) Back when I had an iPod (pre-touch) I could sync the calendars with it. You can certainly do it for the iPod touch. See http://support.apple.com/kb/HT1296?viewlocale=en_US. Bottom line: I’m a little curious about your actual use of technology and knowledge of it.